Frances (Fanny) Isabelle Parnell was born in 1848 in the County of Wicklow, Ireland to a family of wealthy landowners – an Irish father and an American mother. Her American grandfather was Charles Stewart, an admiral who commanded the USS Constitution in the war of 1812. Although Fanny was born into a life of privilege in Ireland – the land of her birth was, during her formative years, recovering from a series of famines that had left over a million dead. Although not directly affected by the famines in a physical sense, Fanny and her siblings were moved emotionally by the stories of Irish peasants powerless against their tyrannical landlords. Fanny, her brother Charles Stewart Parnell, and her sister, Anna Parnell would all go on to become involved in the Irish Land Reform Question. After coming to America with her sister and mother, Fanny voiced her sympathies for Irish land reform and the Irish nationalists in publications such as the North American Review. While their brother Charles founded and led the Land League, primarily a men’s organization working for reforms in Ireland, the Parnell sisters raised funds for the Famine Relief Fund in the United States and later founded the Ladies’ Irish National Land League. Fanny who would go on to become known as an “Irish poet and patriot,” published only one book of poems for the League called, Land League Songs. Her poetry proved to be another way to conjure sentiments of nationalism and the militant tone of her work was in direct contrast to the more sentimental tone expressed by other women poets of the Victorian Era. 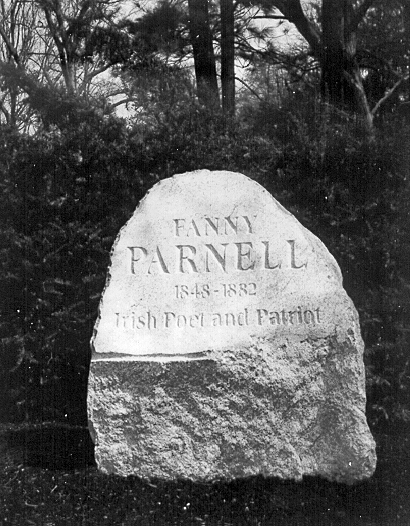 Fanny Parnell is buried in Lot 167 Violet Path at Mount Auburn Cemetery, her unique monument, a boulder, was brought here from her birthplace, the Parnell estate at Avondale House, County Wicklow, Ireland and dedicated in 2001. I have seen this stone and paid particular attention because I think my husband’s family was related to her. There was a Delia Tudor, a relation on my mother-in-law’s side (her mother was Emma Tudor, married to Frederick Converse). I had thought Delia married a Parnell, even the patriot Charles Stewart Parnell, but I may have the generations wrong. Who was Fanny’s mother? Do you have that information? Francis “Fanny” Parnell was the daughter of John Henry Parnell, an Anglo-Irish Protestant landowner and Delia Tudor Stewart Parnell, the daughter of admiral Charles Stewart of the United States. There’s more information about Charles Stewart Parnell and his family to be had at the Wikipedia site, and, I suspect, a good deal more about his ancestry online.